I am so so so so so so so so excited right now. Go here to see the Texas Cornfields Inspired Shoot. I'll have a blog post about it soon on my photography website. what a beautiful shoot!! Congratulations on being featured! Congrats!! The pics are awesome, as is your photo blog :) Great job! Gorgeous pictures! Really! A photographers dream...being appreciated AND featured. :) Fantastic, Shalyn! CONGRATULATIONS!! :D That is so so exciting! shay shay....you are fabulicious. You are going places! I KNOW IT! Gorgeous pictures! I would love to be a photographer! but we all knew this anyway. Off to check it out now!!! How FUN! 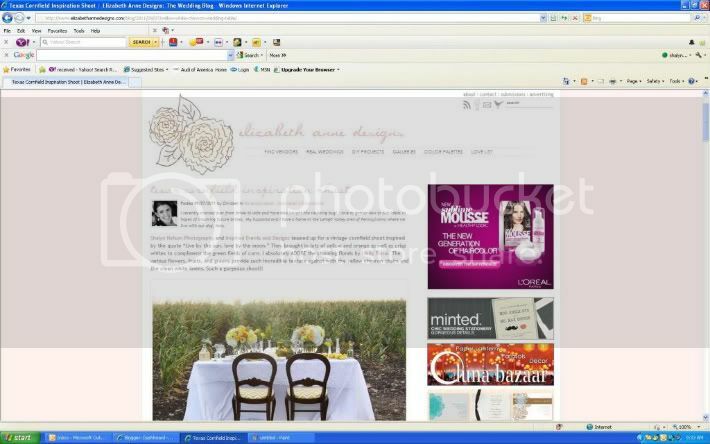 I love that wedding blog and was just catching up on some today...and loved your feature there!!! Absolutely beautiful and the pops of yellow are so cheery and lovely! Congrats!!! I finally got a chance to look at the photo shoot. OH MY GOODNESS Shalyn!! It's AMAZING!